Outdoor improvements are always great and they are just like as we are giving life again to dead spaces of your outdoor! For people having a loving heart for their home, it is really embarrassing to have an outdoor good for nothing! If you have taken as an aim to develop those dull and boring outdoor sections then there are two different ways! One way is to hire the highly skilful professionals and may get very expensive too and 2nd is to become a professional by yourself! 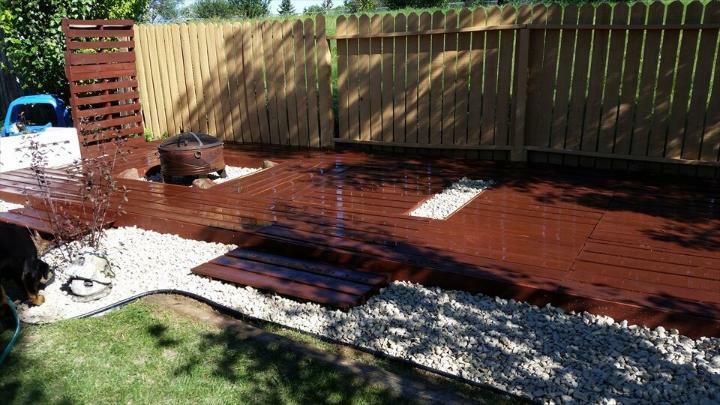 Believe us, you can do amazing construction works just like the professional ones with pallet while renovating a deck, remodeling a patio or making your garden look a fanciful! 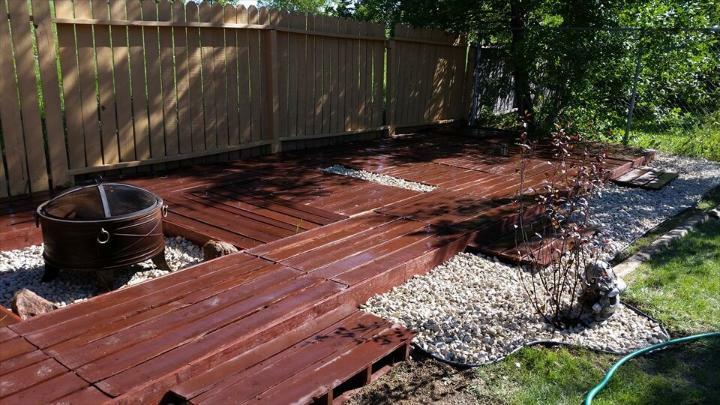 If you are willing to turn a boring piece of land into a small heaven then this DIY pallet deck project is what you are waiting for! 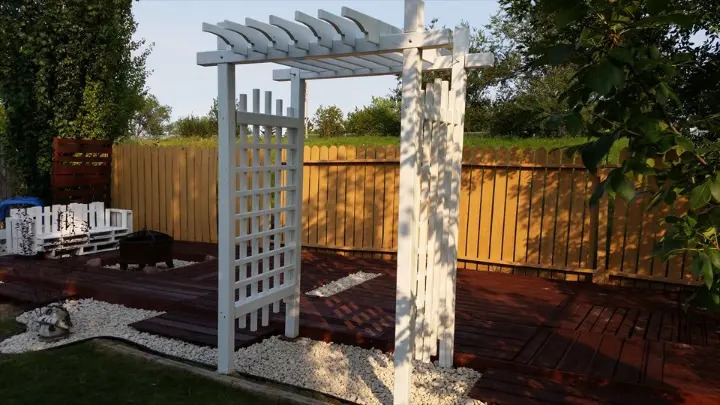 Get the amazing wooden floor by installing the whole pallets to soft garden soil to do so, and get a raised platform to create a sitting and gossip friendly deck space! Matters of child recreation and entertainment can also be handled awesomely using pallets and one example is the stylishly made swing setup here! 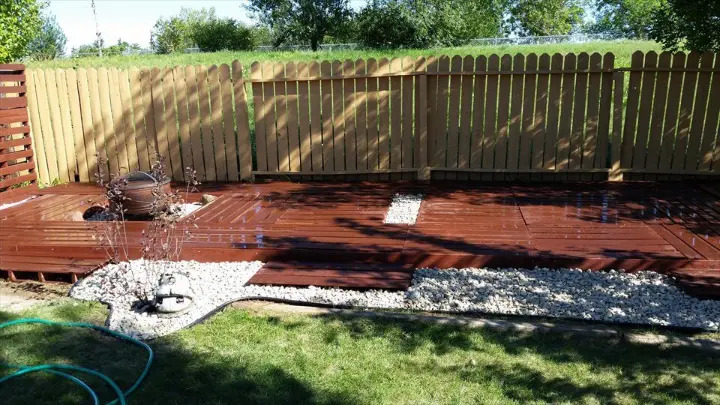 This landscaping pallet project is also much friendly to your hardly earned money and will charge you a very little equal to nothing! There are always some dead spaces at your outdoor that are mostly overlooked due to boring and dull appearance! This pallet deck project is all about how you can makes those dead spaces alive again using pallets! 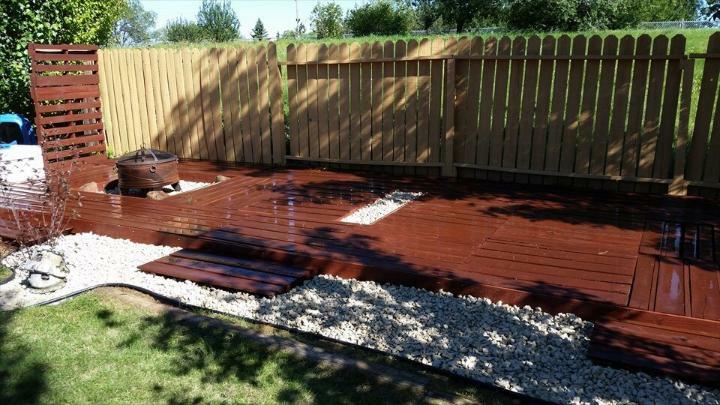 This model is best to renovate any patio, any deck and is good for garden landscaping as well! First of all the accent pallet flooring has been done to gain a wooden platform that can further be targeted for awesome decorative plans! Just floor up the pallet skids and use extra wooden lengths to cover the leftover spacing! Using pre-fabricated pallet units made of dismantled pallets, the whole fencing has been done and boundary wall are too high to cross even by a mature person! Flooring has been done with two leftover boxes inlays filled with pebbles, one would be used for accent purposes while the bigger one can contain a fire-pit setup or a BBQ grill with surrounded party chairs! Pebbles have also been thrown over the walkways and around the edges of the installed pallet flooring to please the aesthetic sense of the visitors and users! White ones have been selected in this case however multicolored or painted pebbles can also be grabbed to satisfy your unique taste of decors! Using remaining pallets a perfect entry gate has been made which is having accent edges heaving duty rafters! A little seat has also been designed to sit around the fire-pit and has been painted in white to match the entrance color! Both floor and boundary wall have been dignified and have been made weather-protected using stain and varnish coats! Wooden flooring comes with a choco look white the boundary all around look enjoyable in yellow!